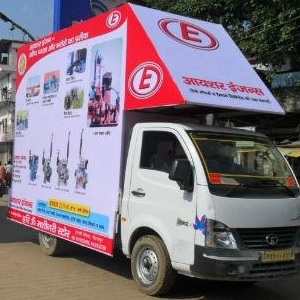 Multi Plus Services provide demo van advertisement that we conducted to increase response from market and increase visibility through Promotion. Multi Plus Services are one of the leading organizations engaged in offering demo Van Branding Service. The offered demo van branding services are highly demanded for its catchy printing & designs. Our demo van branding services can be provided on various specifications as per our customer's want. Multi Plus Services advertises by demo van for Hoarding Display, Unipole Display, Mobile Hoarding Display Vans, Hydraulic Mobile Advertising Vans, Mobile Advertising, Advertising Product Display Vans, Advertising Vans for Film / Movie Promotion, Mobile Advertising Offices, Auto Advertising, Human Banners, Marketing Services, Brand Promotions, Road Shows, Mobile Canters Activities, Mall Promotions and Market Activations.